In an effort to strengthen the liberal forces in Southern Philippines, the National Institute for Policy Studies (NIPS) with the support of the Friedrich Naumann Foundation (FNF) has kicked off a series of seminars on liberalism in Mindanao. 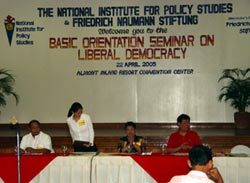 The first two “Basic Orientation on Liberal Democracy (BOLD)”– workshops were held in Butuan, Agusan Del Norte and Siargao, Surigao Del Norte on April 22 and April 24, 2005. Reflecting the strategic importance Mindanao plays in Philippine politics, these workshops have been termed the liberal think tank’s first systematic effort to mobilize the growing number of political leaders in Mindanao interested in joining the expanding liberal camp. Well-attended by local officials, youth leaders, NGO- activists and representatives from the business sector, the workshops provided an overview of the basic concepts of liberalism and the policy concepts outlined in the Liberal Party (LP)’s strategic plan for 2010. In the second half of the BOLD-seminars the participants drew up proposals and strategies to address their immediate concerns. As is the usual practice, the seminars concluded with the participants swearing in as members of the LP. “As the principles of liberalism often remain abstract unless acted upon, the liberal Foundation is happy to partner with NIPS in educating and training individuals from Mindanao and encouraging them to take a more active role in the democratic process,” said FNF Communications Officer Alexandra Cuyegkeng who represented the Foundation. NIPS in cooperation with the Friedrich Naumann Foundation regularly conducts BOLD seminars as part of its program to promote the values of liberalism and to popularize campaigns for liberal reforms and initiatives.